Mrs Betty Bishop shared a recent weekend in London with her son Alan. 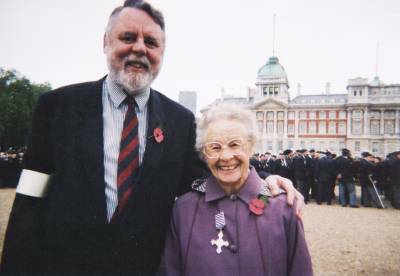 He had arranged for her - as a war widow - to attend the Festival of Remembrance at the Royal Albert Hall, and to join the Parade in the March Past at the Cenotaph - no mean feat for a rising ninety year old. While waiting for the March Past to begin, they were fortunate enough to meet Terry Waite, who was acting as a steward. Like many others, he was interested in the medal Betty was wearing - her husband's D.F.C. This was awarded to him for his part in an horrific raid on Germany. Unfortunately by the time he was summoned to Buckingham Palace to receive this honour he had himself become another casualty of war, and Betty received the medal in his stead from King George VI, as a widow with a young baby - Alan. Betty greatly appreciated her visit to the Remembrance weekend ceremonies. She said it was a sombre occasion, but she also found it very comforting and uplifting.